The latest results from the Chinese stock market 4.cn clearly demonstrate that the numeric domains are worth the investment. However, they must be names within global or ccTLD extensions with a functional application. Recent results of the Chinese stock exchange 4.cn. indicate that a large part of the highest ranked transactions involve the sale of numeric domain names. However, they often fail to be included in the officially published global transaction rankings. The people of China seem to have a special liking for domains containing strings of digits, which translates into the high-amount transactions. Interestingly, it’s not only the .CN domain but also primarily .COM. And while the meaning of these “domain names” is virtually incomprehensible to the Western reader, providing they actually have a specific reference, it is the Chinese’ love for numerology that probably affects the value of numeric sequences. 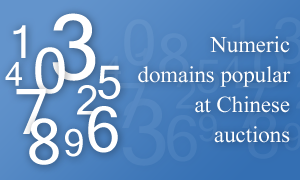 If you think of investing in Chinese domain market, you may consider numeric domains. Click the domain you desire and check the name availability using the search box. If you have questions or need help, please email us at support@web-solutions.eu or call on +44 (0) 208 133 3994.